Boston, MA, January 15, 2018 –(PR.com)– Mona's Curryations is a new start-up in Boston with an innovative food concept that has not been available until now. Mona's Curryations are frozen fully prepped Halal ready to cook entrees that represent Pakistani/Indian cuisine. Since Mona's Curryations has done all the prep work, the consumer only has to defrost the entree, transfer into a stovepot, and cook for about 30 minutes, its today's cooking smart. Only all natural high quality Halal ingredients are used, recipes are authentic, and cooking has never been this easy. There are six delicious entrees to choose from and entrees come in two sizes, retail or foodservice, with either at least 4 servings or 8 servings; respectively. 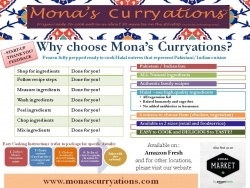 Therefore, whether you have to make an entree for yourself, family, friends, and/or food for many, Mona's Curryations has made it simple, easy, and delicious to cook. Available on Amazon Fresh Local Market Boston and for other locations, please visit the company's website: www.monascurryations.com. Also, check out quick videos on Mona's Curryations entrees on YouTube. As a start-up, Mona's Curryations greatly appreciates if consumers could give the entrees a try as a pilot is currently underway in Boston. Feedback is needed and appreciated. Thank You Boston for trying Mona's Curryations entrees and for spreading the word. Cooking just got a whole lot easier with Mona's Curryations.